Geltrude & Company, LLC is a leading accounting and pension auditing firm that has delivered a full array of expert accounting, auditing and tax services since 1995. Our partners bring a combined total of more than 60 years of diversified public accounting expertise, and our firm’s membership in the American Institute of Certified Public Accountants (AICPA) Employee Benefit Plan Audit Quality Center (EBPAQC) indicates we have met rigorous standards encompassing auditing policies and programs, continuing education hours, quality peer review and annual internal inspection procedures. 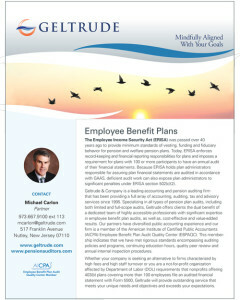 Whether your company is seeking an alternative to firms characterized by high fees and equally high audit staff turnover or you are one of the many not-for-profit organizations affected by new Department of Labor (DOL) requirements that nonprofits offering 403(b) plans covering more than 100 employees file an audited financial statement with Form 5500, Geltrude will partner with you to provide outstanding service that meets your unique needs and objectives. In the early 1970’s, there was great concern when participants in a large unfunded pension plan lost their benefits due to plan sponsor’s bankruptcy. 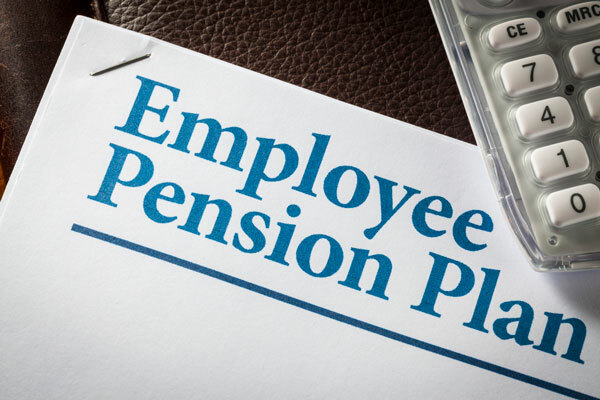 It was not uncommon for employees who worked many years to find that they could not receive any of the accumulated plan benefits upon retirement or termination because of their plan’s strict vesting restrictions. The Employee Income Security Act (ERISA) was passed in 1974 to provide minimum standards of vesting, funding and fiduciary behavior for pension and welfare pension plans. Today, ERISA enforces record-keeping and financial-reporting responsibilities for plans and imposes a requirement for plans with 100 or more participants to have an annual audit of their financial statements. Because ERISA holds plan administrators responsible for assuring plan financial statements are audited in accordance with GAAS, deficient audit work can also expose plan administrators to significant penalties under ERISA section 502(c)(2). Defined Benefit Plan pension plans provide a promise to pay to participants specified benefits that are determinable and are based on such factors as age, years of service, and compensation. The financial accounting and reporting standards for defined benefit plans are quite different and more complex than those for defined contribution plans. Defined Contribution Plan pension plans provide an individual account for each participant and provide benefits that are based on (a) amounts contributed to the participant’s account by the employer or employee, (b) investment experience, and (c) any forfeitures allocated to the account, less any administrative expenses charged to the plan. These plans include (a) profit sharing plans, (b) money purchase pension plans, (c) stock bonus and employee stock ownership plans (ESOPs), (d) thrift or savings plans including 401(k) arrangements and (e) certain target benefit plans. Defined contribution plans are generally less complex than defined benefit plans and thus less expensive to administer. Health & Welfare Benefit Plan pension plans include plans that provide (a) medical, dental, visual, psychiatric, or long-term health care; severance benefits; life insurance; accidental death or dismemberment benefits; (b) employment disability, vacations or holiday benefits; and (c) apprenticeships, tuition assistance, day care, housing subsidies or legal service benefits. A 403(b) tax-sheltered annuity (TSA) plan is a retirement plan offered by schools, hospitals, churches, charities and certain other tax-exempt organizations. An individual’s 403(b) annuity can be obtained only under an employer’s TSA plan. Generally, these annuities are funded by elective deferrals made under salary-reduction agreements and may include nonelective employer contributions. In November 2007, the Department of Labor issued amended regulations eliminating an exemption granted to 403(b) plans from the annual Form 5500 reporting. Generally, 403(b) plans sponsored by charities are subject to ERISA, whereas 403(b) plans sponsored by religious organizations and governments are not covered under ERISA. ERISA generally requires plans with 100 or more participants at the beginning of the plan year to have an audit of the financial statements, and IRS form 5500 requires plans that must be audited to attach all audited financial statements. At present, ERISA, title 1, section 103(a)(3)(C), and DOL Reg. 2520. 103-8 allow a “limited scope audit” of plans with assets held by banks, financial institutions, or an insurance company that is regulated, supervised and subject to periodic examination by a state or federal agency.